Serenity and calm (and three eyes) pervade this simple finger-puppet style figure, a collaboration between Mitari and Gargamel. 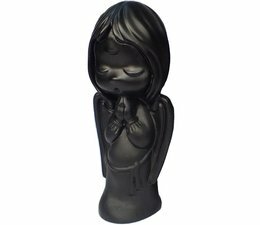 The figure stand about 5" Tall and is made of Black Unpainted soft vinyl. This is the Black edition of the Obake-Mitari-chan figure, create by Mitari x Gargamel. The Obake-Mitari-chan (Black) by Mitari x Gargamel is a limited editon that was made to order.